The developers of Residences by Armani/Casa and their contractor are facing a lawsuit from a neighbor who alleges building materials from the Sunny Isles Beach luxury development crashed through the roof of his home, striking him while he was in bed. 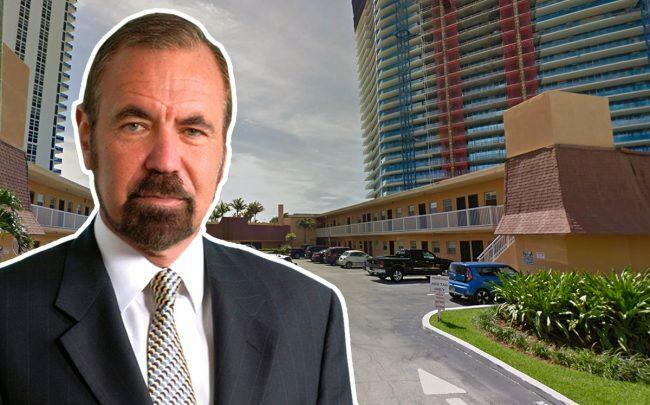 Carlos Pedotti filed suit last month in Miami-Dade Circuit Court against RDR Seashore LLC and Coastal Construction for negligence, seeking a judgment for unspecified damages that would include the costs of hospitalization, medical and nursing care and treatment. According to the suit, Pedotti lived at 19051 Collins Avenue in Sunny Isles Beach at the time of the December 2017 incident, next door to Residences by Armani/Casa, a 56-story luxury tower under construction at 18975 Collins Avenue. The Related Group, Dezer Development and Rockpoint Group are developing Residences by Armani/Casa. A spokesperson for the developers declined comment on the lawsuit and a spokesperson for Coastal also declined comment. Pedotti’s attorney, Danny Marin, said his client lived in a second-story apartment of the two-story building, and was in bed at the time of the alleged incident. Marin declined further comment. The suit alleges that the developers had a duty to exercise reasonable care in the maintenance of the construction site and ensure it was safe, and to warn Pedotti of dangerous and unsafe conditions. It also alleges that it owed Pedotti the duty to properly train, supervise and monitor employees to perform their jobs in a safe manner. According to the suit, because of the developers’ breach of duty, Pedotti suffered “severe bodily injury, resulting in pain and suffering, disability, disfigurement, mental anguish, loss of capacity for the enjoyment of life” as well as expenses for hospitalization, medical and nursing care and treatment and lost income. “Pedotti’s injuries and damages are permanent and Pedotti will continue to suffer injuries and damages in the future,” the lawsuit states. Residences by Armani/Casa is planned to be the first Armani/Casa branded building in the U.S. It is expected to be completed this year. The tower is planned to have 308 units, priced from $2 million to more than $15 million for the Giorgio Armani-furnished penthouse that comes with a trip to Italy to meet Armani. The developers broke ground in 2016 and secured a $305 million construction loan. That year, the project also opened a $10 million sales center.